Largest square shaped wet room trays available to buy in our store. Can be supplied with linear and square drainage. Equipped with stainless steel wet room drain, waste trap with pipe. Optional waterproofing materials can be included. 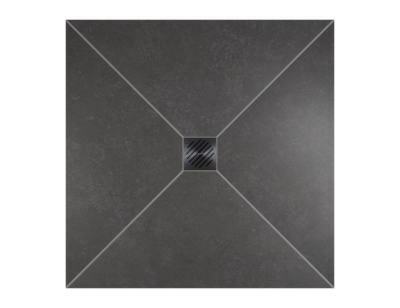 Products suitable for concrete and timber floors. Must be covered with tiles. Wet room former has 4 way slopes, meaning that your tiles will have to be cut diagonally to match the premachined slope of the board. We include the longest linear shower channel to this walk in shower flooring - 1200 mm long stainless steel channel. It is integrated with the tray during the production process and comes with watertight seal. 64 mm wide stylish grate cover and comlpete siphon trap with capacity of 26 l/min and 20 mm high water seal arrive with the former. Ponente grating is a plain bar of brushed steel cover with no holes, only channels aside. It's the longest linear gully we include to our wet room kits so it can be considered most luxurious. We include the longest linear shower channel to this walk in shower flooring - 1200 mm long stainless steel channel. It is integrated with the tray during the production process and comes with watertight seal. 64 mm wide stylish grate cover and comlpete siphon trap with capacity of 26 l/min and 20 mm high water seal arrive with the former. Zonda is a grill with angled rectangles across the entire top cover. It's the longest linear gully we include to our wet room kits so it can be considered most luxurious. We include the longest linear shower channel to this walk in shower flooring - 1200 mm long stainless steel channel. It is integrated with the tray during the production process and comes with watertight seal. Sirocco cover holes pattern consists 3 rows of squares, parallel to drain edge. 64 mm wide stylish grate cover and comlpete siphon trap with capacity of 26 l/min and 20 mm high water seal arrive with the former. It's the longest linear gully we include to our wet room kits so it can be considered most luxurious. We include the longest linear shower channel to this walk in shower flooring - 1200 mm long stainless steel channel. It is integrated with the tray during the production process and comes with watertight seal. Tivano cover has 4 L-shaped rectangles with a square in the centre pattern. 64 mm wide stylish grate cover and comlpete siphon trap with capacity of 26 l/min and 20 mm high water seal arrive with the former. It's the longest linear gully we include to our wet room kits so it can be considered most luxurious. Chat started. Session ID: 1556250721. You are now connected to: David M.